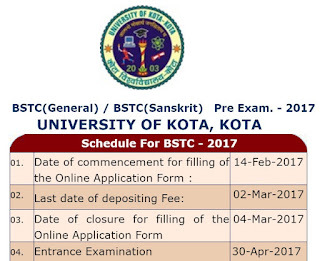 BSTC Exam 2017 Vigyapti, Date, Old Papers, Apply Online: Kota University, Kota has issued BSTC 2017 exam notification 01/2017 for Rajasthan BSTC Examination 2017 on 13th february 2017. Kota University invites online application form through official website www.bstc2017.com and www.bstc2017.org. So all eligible candidates who want get admission in Teachers Training Programme can apply through online as well offline mode. Qualification: Candidates should be done Intermediate (10+2) with 50% marks from any recognized Board. 45% for reserved candidates. How to Apply: Applicants should visit official website www.bstc2017.com and www.bstc2017.org and fill the online application form with correct data and submitted it with payment of fee. Candidates should visit official website for more details and apply online.